Someone else will know a lot more than me about these no doubt, but when I went over to Venice a couple of years ago these were still being made. I also had the feeling that they were newer pieces, perhaps because they are so perfectly executed. However, I do not know the age. Absolutely lovely and I am confident that they are Venetian glass. Our organisation deals with Venetian murano glass blowing furnaces that produced Venetian goblets in the 17th century style known as FACON DE VENISE which tranlsates virtually to "IN THE VENETIAN STYLE". 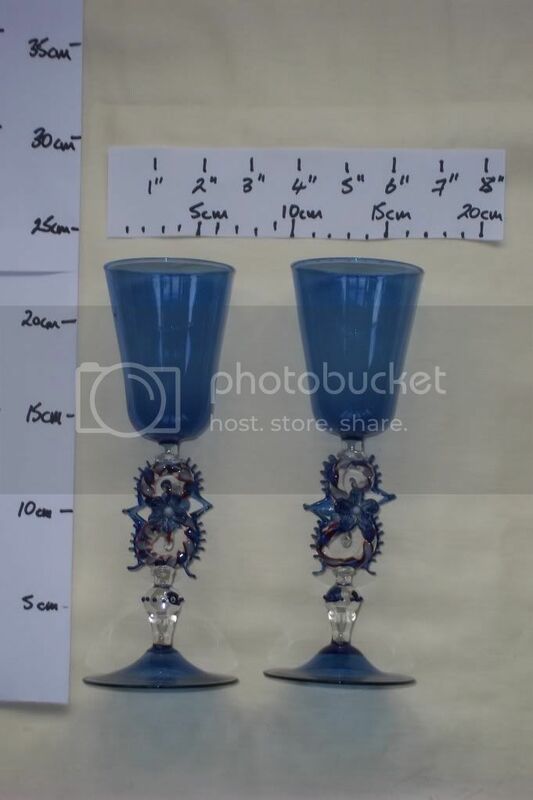 These goblets are definitely in the Facon De Venise style and the techniques used are similar to that of Murano, but the addition of flowers to the stem is not a known technique used when producing Venetian goblets which indicates a 98% plus chance that these are indeed Chinese or of some other origin. Please visit our website to view authtentic Facon De Venise goblets produced in Venice and you will see exactly what I mean. The stems are all wrong, the addition of flowers to the stem is a dead giveaway that they are not of Venetian origin but highly decorative none the less. 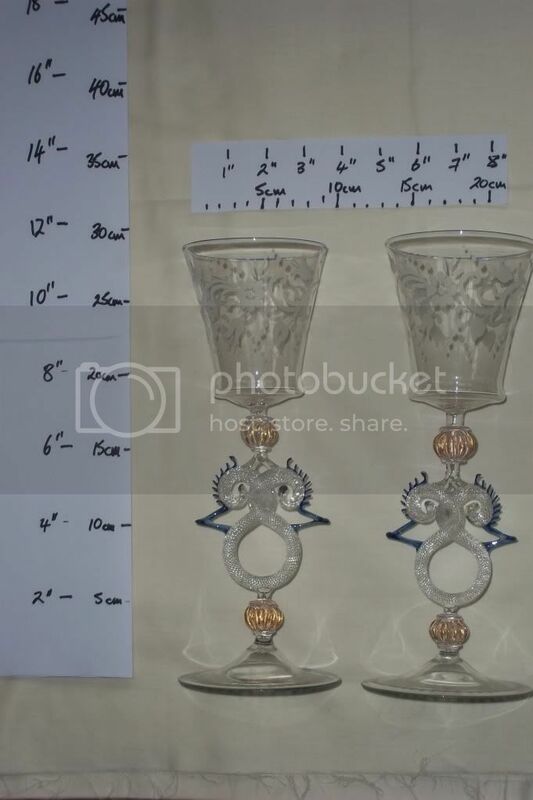 The link below is just a small selection of Facon de Venice goblets, chalices etc that you can view with an embedded video showing the production of such a goblet which although it seems simple enough, it is mindblowingly difficult and can only be done by the Maestro, not his apprentices due to its technical difficulty and the fine window in which they have to work when the glass is semi solid and solid. Mod: link to sales website removed AGAIN as sales plugs are only permitted in Market Place. Read Board Policy! The flowers are not the norm for Venetian stems, but there are exceptions. I located one at our member Alex's Art of Venice site. So having flowers wouldn't be a definite indicator the stem is not Venetian. My understanding of facon de Venise is that it is a French term meaning glass that is made in the traditional Venetian style of days gone by, but that is not made in Venice. 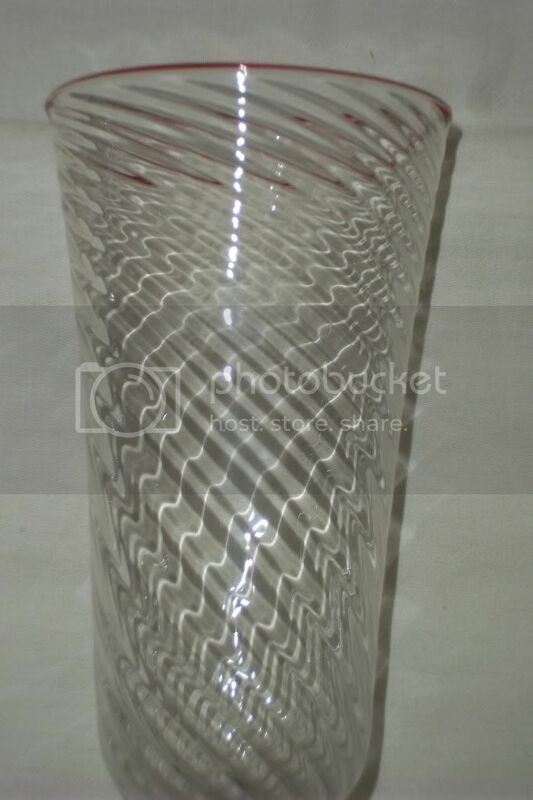 Facon de Venise glass from France and England were very popular earlier in the 20th Century. I don't know how long the phase lasted (or if ever stopped). In my mind it would be redundant to call Venetian glass facon de Venise. I wish we could find this exact goblet so we would know where it was made. Unsigned glass can be so difficult. You are correct about the term FACON DE VENISE which means VENETIAN FASHION. 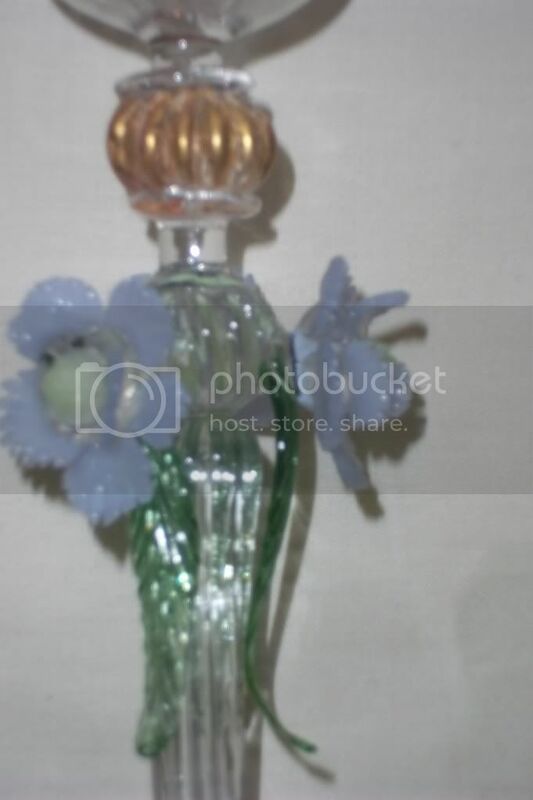 I also understand that the application of flowers could be used but from my experience, this is an extremely unusual style very rarely seen if any and if they are indeed genuine Murano, then they could have been made for a private client which is always a possibility as the Muranese do undertake these requests. In all my years, I have never seen anything like them. As our website and business is the largest of its type anywhere on the web and the MASESTRI we deal with utilise this term in their own work, I am very happy calling the glass on our website and indeed those that are similar FACON DE VENISE as the technique is still used by the furnaces we deal with and as an accurate representation of a lost 17th century technique and style. Thanks for your input also. Dean, one thing I've learned about Murano glass is that there are no absolutes. If it could be done in glass, at least one artist did it. What you wrote about the goblet made me think about an origin outside Murano. Venetian goblets go for a premium on the primary market, so there is incentive to make ones that will pass as the real things. 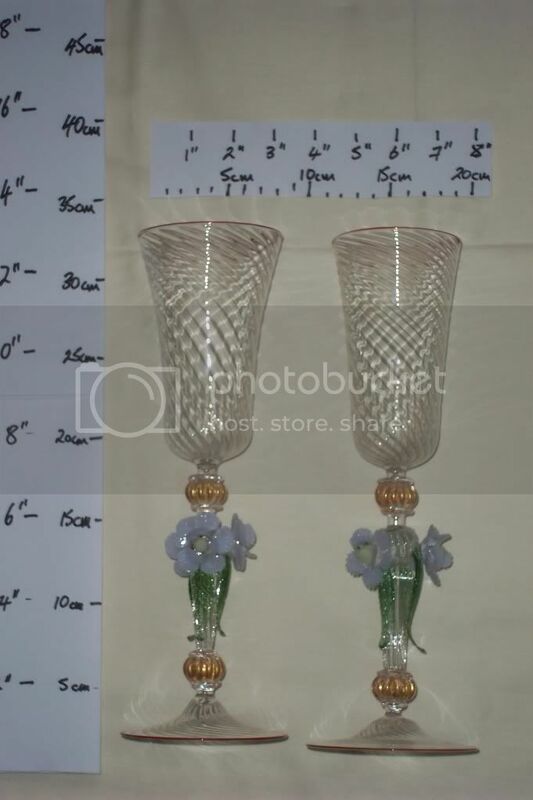 I have spent a few minutes searching different sites for goblets, but have not found this design yet. 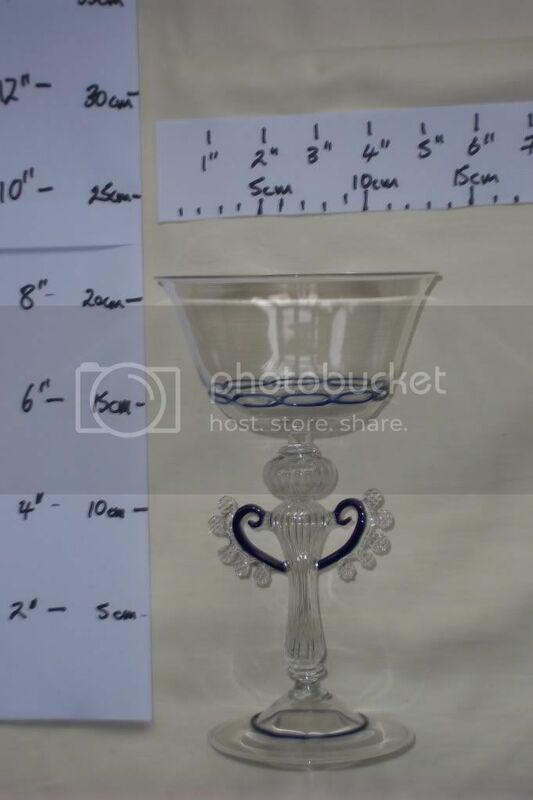 The stem itself looks very Venetian, but that could be done by talented glassmakers in different countries. Maybe someone will chance upon a documented goblet of this design. I also concur about no absolutes when it comes to Murano glass as there are many fakes floating around. I am well aware that Venetian goblets do command a premium on the market and this is why our goblets all hand made by the Maestri of the furnaces we deal with, are all genuine and take an incredible amount of skill and time to produce. I agree that the stem does indeed look venetian but the whole composition of the goblet itself just doesn't seem right. I agree that it may have beem made by another talented glass master from another region as many of them visit venice to glean techniques used that are centuries old then apply those to their own works. Thanks for all the comments, that I'm afraid both help and confuse an amateur like me :-). The collection all came from one place. To help, and I know its a little cheeky, I've added some other pics of other of the glasses, some that perhaps conform more closely to Dean's helpful illustrations, but there are also others with flowers. 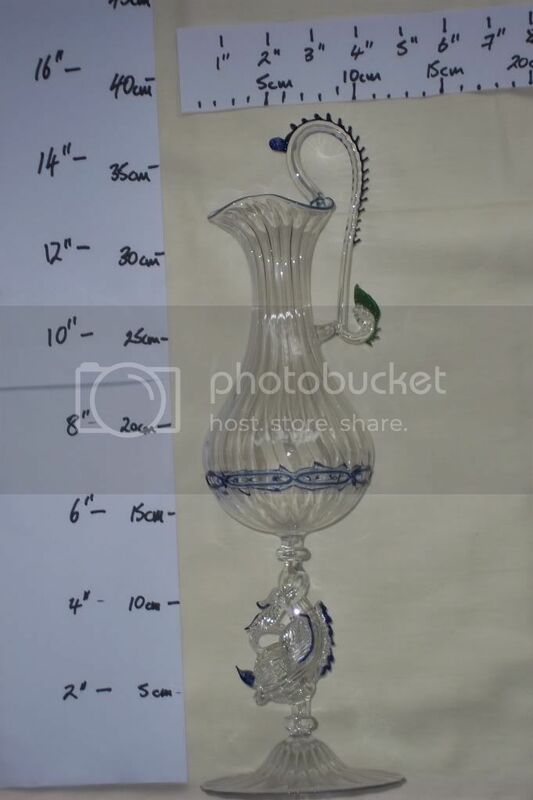 This is a bit of a voyage of discovery for me as I've been a collector of 18C English glass for some time but know very little of Murano glass of this type (though I have visited there and it is fascinating. I appreciate your time being given to help a novice. The initial set of goblets you had pictured may now indeed by Muranese / Venetian that is from Murano. There have been a lot of furnaces, smaller ones at that which may have fallen by the wayside and the goblets you showed initially may have been experimental pieces and quite a few furnaces still do this jsut to test the market and see what sells. 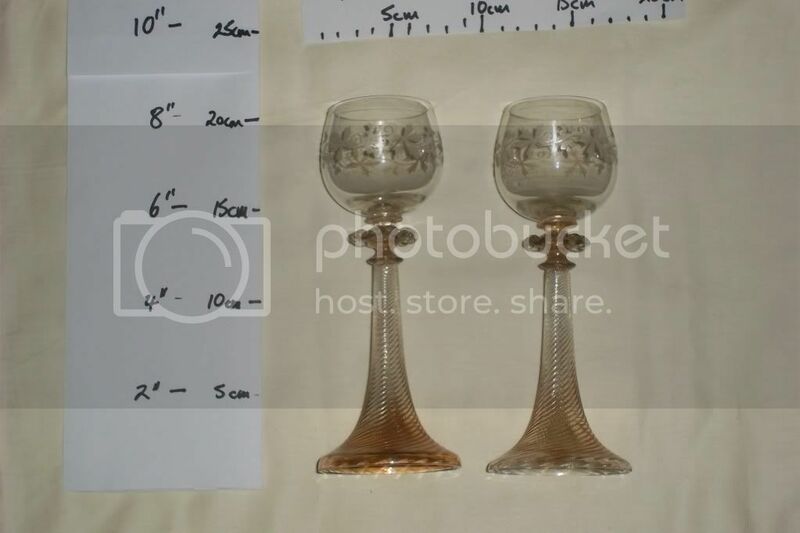 This is why it is quite rare to find the same style of goblet / chalice in great numbers as they simply do not do this. Every order that we place to our sisiter furnaces in Venice is for items made to order and this is why the showrooms in Venice may have some items in stock, but they very rarely have large number of everything in a showroom simply because it is not viable. They may have 1 or 2 pieces of something sitting around, then either the customer purchases the showroom stock or they have it made in another colour / style gleaned from other products in the room at the time. There are over 176 showrooms in Venice with most of the furnaces operating on the mainland due to space restrictions and other considerations. I can steadfastly assure you that when it comes to ordering Murano glass wether it be chandeliers or alike, unless a supplier has order a substantial quantity of items of the same genre such as clowns, then every other piece is made to order. This is how we operate and is the reason for our success.